There they are, poetic objects in the Little Universe, revolving around themselves, whispering to each other, regardless of whether or not they are visited by you—their exotic guest. Each object has its own temperament—a tendency to get close to someone, and to run away from another. In this way, the Little Universe reveals its rich dynamics. 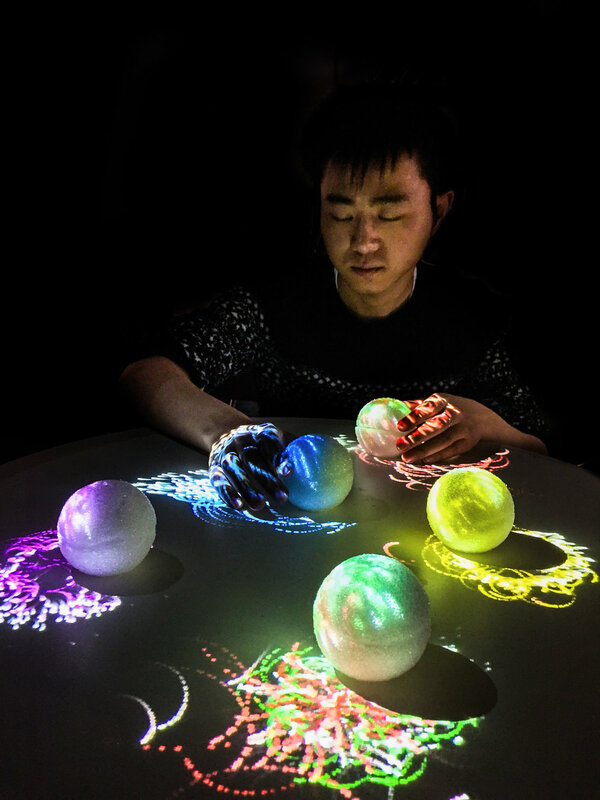 This interactive installation is designed to bring about a serene and meditative atmosphere. It has an intimate physical form, inviting the audience to interact with it, to touch and move it with their hands. Without interfering with the dialogue between the objects, the audience can still enjoy the poetic scene by watching, listening and contemplating their behaviors and relationships. While the audience is not explicitly informed of the logic behind the behaviors, the five-element theory (五行) of Chinese philosophy inspires the distinct characteristics and relationships between the objects. The colors of the five objects represent the five elements—metal (金), wood (木), water (水), fire (火), and earth (土). There are two orders of presentation within the five-element system: in the order of mutual generation (相生), one element can give birth to another, while in the order of mutual overcoming (相克), the element can suppress yet another. Represented by the attracting and repelling forces between the particle systems surrounding the objects, the relationships between the poetic objects enrich the contemplative intricacy of the Little Universe. Little Universe is a collaboration among SHI Weili, Miri PARK, and Saman TEHRANI.